In the last portion of the 20th Century, this train was known on the Atchinson, Topeka & Santa Fe as the 991. Seen here, the ZWSPNBY speeds through Empire, CA., on a warm afternoon. 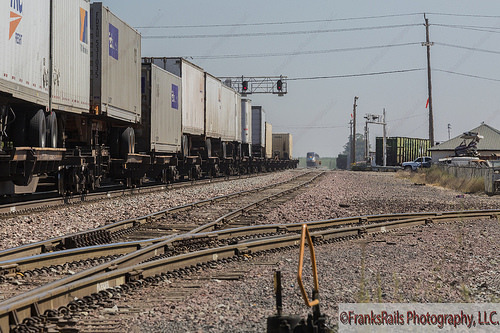 This train crew is doing their best to make up time as computers in Fort Worth, TX., are causing havoc system wide. Meanwhile, the Amtrak California San Joaquin train I was aiming for, leaves a trail of dust in the distance. The innermost nature of the human mind and heart becomes to key to an epic struggle for power…and a riveting story of politics and passions, manipulation and love, destiny and individual courage. Set in the universe of the Hugo Award-winning Downbelow Station, S. F. master C. J. Cherryh again brings us a wonderfully detailed world…and her most challenging and mature work to date. 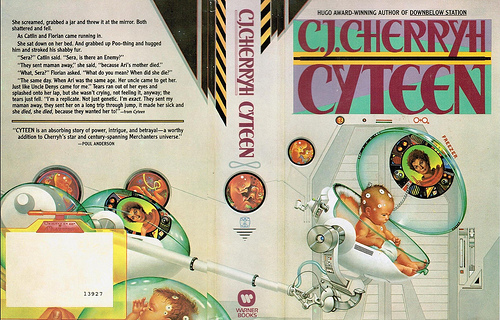 CYTEEN is the story of the Project: the plan to replicate Ariane Emory. Creating a genetic double is routine for Resune’s bio-technology, but nature is not nurture, and clones are still human beings. For the Project to succeed, Emory’s followers have to subject the clone to every formative influence of the tyrant’s life, keep her innocent of history, protect her from Emory’s enemies, and oppress or silence anyone who might, even accidentally, disrupt the program.